What does it take to turn a challenge into an opportunity? We think it takes information, collaboration, and a willingness to do things in a way we’ve never done before. But perhaps most importantly, it requires our ability to take an honest and thoughtful look at the way in which we communicate our views on our community. There is a saying that “perception is reality,” and so, it’s good to take a step back and look at the lens we use to see all of what Broome County provides. The Agency began a proactive Business Retention & Expansion program last fall because we wanted to identify the financial tools that businesses needed to help them maintain or expand their operations. We also wanted to confirm what we thought to be true; that we have a number of healthy companies in Broome County that could expand tomorrow if they had one critical tool – the ability to retain and attract the right people. So what do the “right people” look like? What education, training, or skill sets are required to fill the more than 2,000 job openings that are currently available? As the lead economic development agency for Broome County, we recognize that it is our responsibility to understand and respond to changes in the economic climate. So, if a tool to attract and retain talented people is what we need to create, how do we do that? First, we identify the challenge. The most critical economic development issue facing our community over the next decade will be the retention and attraction of skilled professionals and highly qualified workers. A few of the key data point to a number of challenges now and into the future. Some of these significant issues are the outmigration of talent, an aging workforce, and the need to match training programs with the actual skill sets required of the jobs. As reported by Jon Roby’s article, “I Leave NY,” Broome County is one of the communities hardest hit by outmigration, with nearly three percent or 5,400 leaving the area since the 2010 census. We also know that we have an older workforce, the average worker approximately 45 years of age. It is anticipated that thirty-percent of the Broome County workforce will be aging out over the next five to eight years and this cuts across industries such as health care, manufacturing, banking and finance and the skilled trades. Daunting challenges, yes. But what will set us apart is the depth and willingness of time, understanding, and patience required to face the challenges head-on. And that’s what we’re doing. Albert Einstein said, “we cannot solve our problems with the same level of thinking that created them.” We couldn’t agree more. Now, more than ever, there is an imperative to do the work required to re-position Broome County as a thriving community with boundless opportunities for advancement. 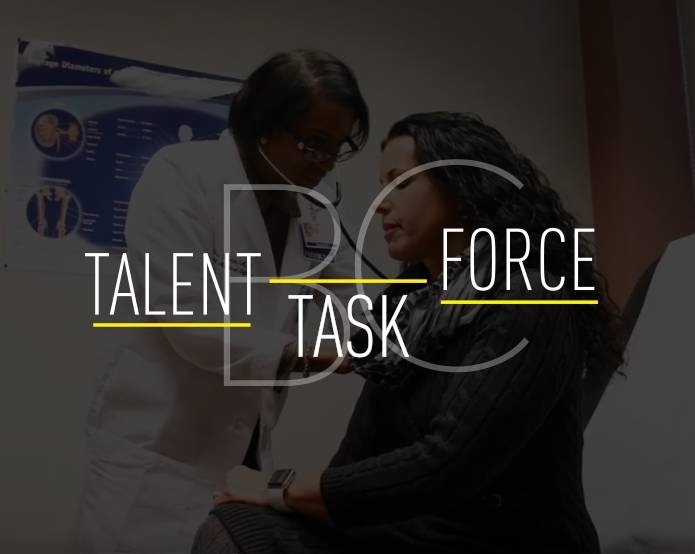 The Agency enlisted the private sector as well as business development, education, and workforce partners to create the Broome Talent Task Force. Peter Newman, regional president of M&T Bank and Anthony Paniccia, president & CEO of Delta Engineers will serve as Co-Chairs of this effort as representatives of two prominent businesses that have achieved growth in Broome County. This unprecedented effort will bring together all of the major employment sectors driving our economy, including health care, education, engineering and production, manufacturing, construction and skilled trades, and information technology to create a comprehensive and collaborative action plan to attract and retain a strong workforce over the next decade. The goal of this effort will be to create an actionable and sustainable talent retention and attraction strategy to reverse the trend of outward migration and set us on a path toward economic prosperity and perhaps more importantly – economic diversity. The members of our Task Force know what it takes to grow a business and attract top talent, and we are confident that we can achieve this goal. We will educate our Task Force with critical data and analytics, invaluable feedback from focus groups of industry leaders, high school and college students, young professionals, entrepreneurs, skilled tradespeople, people relocating to the area, and current job seekers. .
We will leverage our data and information to promote Broome County as a place where people can find challenging career opportunities and a satisfying personal life – a good life. We will actively and positively tell the stories of people choosing Broome as the ideal place for work and life and work with companies to recruit the best and brightest to their teams. We’ll work with our resource partners to identify career pathways to provide them access and opportunity for economic advancement. We’ll identify the barriers to employment and work with our elected officials to find ways to eliminate them. Through the efforts of Broome Talent Task Force, we are poised to make to make a tremendously positive economic impact in our community. We encourage area business leaders to join us, and our neighbors throughout the county to get involved. Collectively, we can empower our employers, educators, job seekers, students, and resource partners to define our economy now and for the next generation of Broome County residents.